My name is Kara Winger. I’ve been a professional javelin thrower for close to a decade. I’m a three-time Olympian (Tokyo 2020 will be number four and my best, fingers crossed), and am the American Record Holder in my event. I’ve also had two major surgeries, and countless other injuries that required focused rehab and coordinated effort with my physical therapy team to return to and surpass my best. Physical therapy seems like a drag. It’s something most people experience only when life already has them down, and then seems just like a metaphorical kick. But it doesn’t have to be that way! Physical therapy seems like a drag. But it doesn’t have to be that way! I want to help you understand how to go to the Physical Therapist. I want people to see that this field of medicine can be an incredibly powerful tool in anyone’s life, not just an athlete’s career. Rehabilitation exercises that I’ve learned will have a place in my fitness practices for the rest of my life, regardless of how much longer my javelin career lasts. I believe you should consider rehab for life, too. I believe you should consider rehab for life, too. Maybe you think you understand what your problems are. Perhaps you’re so used to the pain you’re feeling, that you are stubbornly misdiagnosing yourself. The body is so much more complicated (read: Amazing) than you realize, but it also communicates with someone who is passionate about healing it very effectively. Head into a first appointment with an open mind to ways of fixing your physical problems that you never would have thought about without the expert. It’s a professional and compassionate physical therapist’s job to take the full-body approach to your healing that a medical doctor doesn’t have the time or tools for. Get excited to experience new horizons. Recognize the professionals in the room. Be open to their input. Not only will you learn things about your body during the diagnosis and healing process, but, likely simultaneously, you will be bad at stuff. Physical therapy exercises are difficult for a reason: You’re deficient in those areas, and that’s where your pain originates. Understand that failure at exercises or weakness at first are expected. Embarrassment is natural, but focus is paramount. Everyone who seeks physical therapy help feels weak and embarrassed at some point. As long as you can embrace that starting point and focus on improvement, you’re winning! 3) Be willing to work. Work hard during your therapy sessions. You’ll get excellent feedback from your physical therapist if you show them your best when their eyes are on you. This is an opportunity for you to improve your life, not an obligation. Take advantage of it! I’ve watched many elite athletes simply wait to get better after surgery, then fade from competition. Don’t wait to feel better, work to get better (with an excellent PT team advising you). 4) Plan for behavior change. The majority of your healing doesn’t happen in the clinic. The best results I’ve ever had after major injury have come when I’m truly committed to my rehabilitation at home as well. Turn on a show or rock some music, and get those exercises in during down time each day to maximize your chances at a pain-free life. Better yet, incorporate your rehabilitation into your actual exercise. Rehab doesn’t have to be boring, and once your skills in the physical therapy realm improve, you can get tons of effective work out of implementing rehab as fitness. What’s better than moving your body for health? Moving your body correctly for health. You might also think about how you could change your daily behavior to commit to your health before you walk into the office of a physical therapist. A one-hour appointment still leaves 23 other hours filled with potential. Set some lifestyle goals before you go to the PT: Where are there some pockets of time in your day that you could squeeze in a set of rehab? Take small actionable steps first, observe how your body changes, and accelerate from there. Plan ahead to heal! 5) Speak up with questions and feedback. Many people are intimidated by medical jargon. If you don’t understand the idea behind certain exercises, ask. Understanding fully why you’re doing things only encourages you to do those things more. Recognizing completely the goals of your physical therapist in assigning you certain exercises will help you keep those goals in mind as you work toward them. Communicate. Be clear about your own desires and how you can achieve them together. Physical therapists love making a difference in their clients’ lives, so they are always open to ideas about how to improve your daily experience together. Don’t be shy. Attention to detail. Not quick to tell you what your problems are but willing to spend the time to be thorough in diagnosing you. Personality. Put you at ease. Alleviate some of your stress about an injury through honesty, compassion and straightforward plans to help. Interactive. Solicit feedback from their clients rather than sticking rigidly to something that might no longer be working. Check their own egos in this way by creating flexible new plans. Active. Physical therapy is not only soft tissue work. Rehabilitation exercises are just that: Exercise. The best PTs in the world make that exercise challenging, but fun. Seeing my own improvement through hard work is one of the most rewarding things I’ve ever experienced. Empowering. Teach you about your body’s movement and how to make it optimal. Encourage you, regardless of athletic ability or starting point. Give you the tools through interactive education to implement what you learn from them for life. I encourage you to invest in your health and your future by visiting a quality physical therapist like Sports Performance Physical Therapy. Don’t wait for major injury and the wrong headspace to force you into rehabilitation. Move and live optimally now. This informative and fantastic guest blog was written by our very client, Kara Winger. 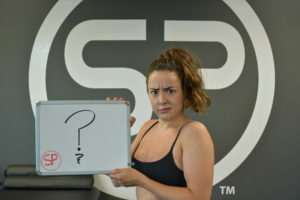 Kara travels from Colorado to Sports Performance to get updates on her training programs and get tune ups to ensure she is performing at her very best.